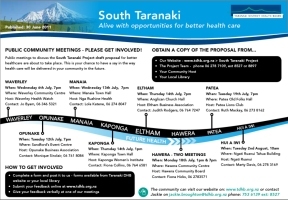 TDHB South Taranaki Health Review - "South Taranaki - Alive with opportunities for better health care"
Identifying Need: Following a short period of "Community Consultation", a number of submissions and reports appeared identifying the health needs in South Taranaki. 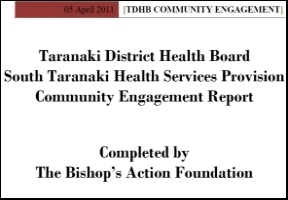 The largest Independent Report was commissioned from the "Bishops' Action Foundation" [See below] revealing that way ahead of every other need in South Taranaki, was Access to GP services. A distant second was Access to Specialist & Hospital Services. Information was given to the Steering Group but collated by TDHB management. Workshop: A three Day "Gemba" Workshop of management and some clinicians considered the information and came up with a "hub and spoke" model for discussion. Despite management claims, this was not particularly representative [-see Gemba Participation (pdf)], only really considered the Midland's Regional model and was not particularly well received by local clinicians. 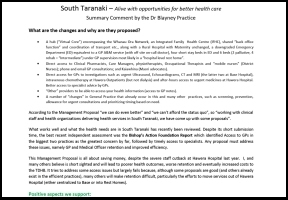 Source of downgrade moves: Proposals to reduce In-patient ward bed numbers, have GP beds (in Rest homes or Hawera Hospital) and downgrade the Emergency Department were not requested nor endorsed by South Taranaki clinicians or representatives but generated by Sandra Boardman with advice from a few North Taranaki clinicians. 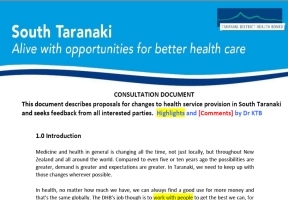 Her bed review proposed 4 "Assessment / observation / treatment" beds, 2 "Palliative" and 4 "Intermediate" beds but didn't allow for anyone not meeting these criteria, who currently obtain in-patient services at Hawera, nor for fluctuations. Big Business: Jean Pope obtained support in the form of a formal letter to the DHB from 8 of the larger industries in South Taranaki "that a 24 hour emergency department and a base level of hospital services should incontestably remain at Hawera Hospital" These industries were: Fonterra, Vector, Yarrows (The Bakers), Riverlands, NDA Engineering, Croucher & Crowder Engineering, Silver Fern Farms and Origin Energy (Kupe). Facebook: A number of people from the community asked if someone could set up a Facebook page to give the people a voice, apart from formal meetings, petitions and submissions. Ross and I suggested Kelly Judkins, who was happy to do this with support from members of the HHCC. 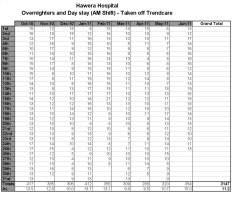 If you are on Facebook, search "South Taranaki Needs Hawera Hospital" click "like" at the top, then click "share". There were 99 "likes" within 3 hours of this page going live last Friday, after a week it is was 605 "likes" with 20,000 "hits", by the end of the 2nd weekend it is up to 693 "likes" and over 30,000 hits! Mary Bourke (Chairperson of the TDHB) has stated that submissions through Facebook are acceptable. The Management Proposal was released [see the TDHB website: www.tdhb.org.nz/misc/projects/southtaranaki/proposal.shtml]. I have made a one page summary and practice response [ see Blayney_Summary_of_Management_Proposal_for_ST.pdf] as well as a "blow by blow" critique of the whole Management Proposal [ see ST-health.pdf]. Feel free to download any of these to aid in any public feedback and/or submission. Alternative Model: A number of alternative models are already listed on the TDHB website at www.tdhb.org.nz/misc/projects/southtaranaki/project_phases.shtml]. The "GP Roma Tika" model uses the concept of the correct (Tika) flow or current (Roma), ensuring a patient can access the best and most appropriate care, (including health protection) with the fewest delays, cost and duplication. However, it retains the GP as the prime initiator and overseer but frees him/her from the most frustrating aspect of care, fighting bureaucracy! Repeated studies have shown that while low income is the prime factor in the New Zealand GP exodus, "bureaucratic intervention" and "being undervalued" comes in as close 2nd and third reasons given for leaving. Similar reasons occur in difficulty retaining hospital doctors. 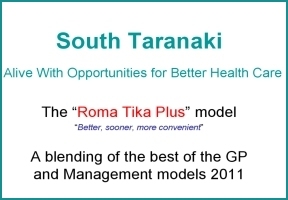 The model which I support is a "Roma Tika Plus", which clarifies the GP model and includes the best bits of the Management model. My Submission: It is clear that the Management Model is unacceptable in its downgrading effect on Hawera Hospital and the flow-on effect for GP retention. The "Hauora Network" concept is too vague to understand but appears to be an attempt to shift costs to PHOs and generate another unwanted layer of bureaucracy and control over the efficient private practices, although I could be wrong. I certainly believe that it is not our job to find new funding streams for the TDHB. However, there are compelling reasons to look at a shift away from the inefficient, fragmented and unappealing aspects of the current situation to improve efficiency, access and retention. This is outlined in our Submission which I invite you to read, criticise, share, and copy so that the Steering Group and the TDHB members have something workable and acceptable to all.